So I’m on leave for 9 days, and it’s….. wait for it….. Ceiling Week! The main saloon ceiling panels have been cut, shaped and painted with primer, undercoat and gloss over the last few weeks. Fire retardant emulsion is being applied to the top surface prior to fitting. The first pieces to go on have been the new bulkhead panels. Those in the coach were not original, but had been thoroughly chewed and modified and patched up so with the spare from the ceiling we’ve made a new set. These have been fitted, and the holes drilled for the passenger communication gear. 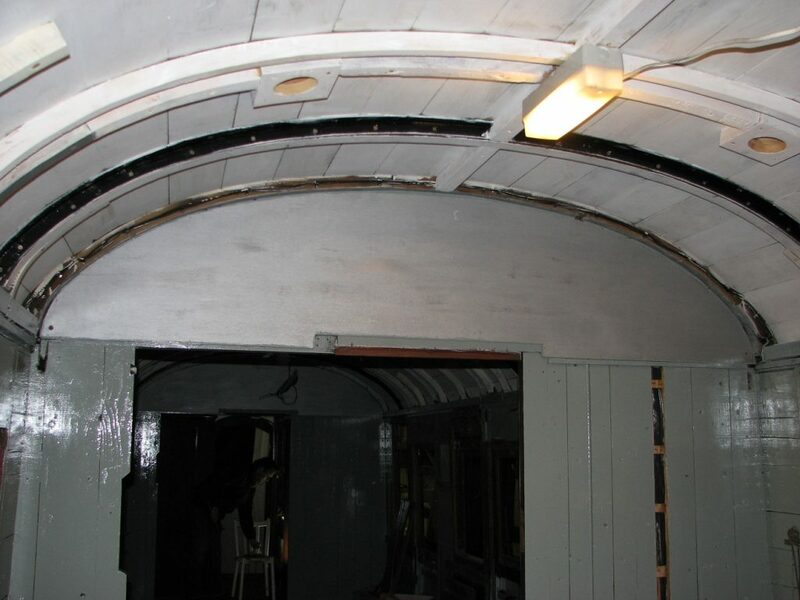 The whole underside of the roof has been painted with the same fire resistant emulsion, and several metres of new wooden conduit manufactured to replace broken and missing sections along the cant-rail. The ceiling springs off this, so it’s important that it fits properly. Plan- tomorrow, two of us are going to run a covert operation to trial fit the first ceiling panel. 14 big ones, 4 vestibule panels, 2 toilet panels, 4 sections above the luggage racks and gangways, plus around 150′ of beading, 9 light bases, 16 ceiling vent covers and 120′ of passenger communication tube to fit. Best get started! Excellent stuff! 9 whole days? Wow. I best get mi finger out with the doors.